In order to make your brick kitchen stands out and really set your brick kitchen apart is by installing new cupboards directly into your brick kitchen’s surface. 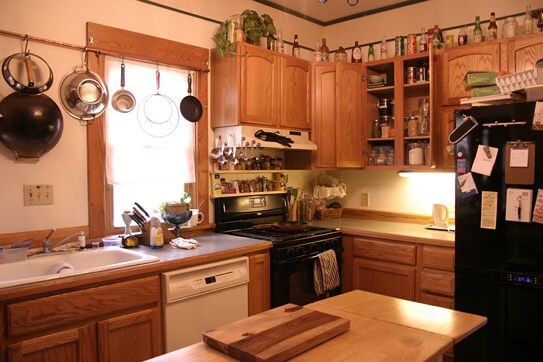 By simply adding new cabinets, you would be able to make the kitchen area look a lot fresher and more organized. You can install cabinets in any number of arrangements that you think suitable for the brick kitchen. In addition, you can also design the plan for installation on your own in order to guarantee that the result can fit into your kitchen’s need and requirement. As for the old cabinets, you can keep them in a safe place as your resource whenever you want to design and build other future do-it-yourself projects such as making desks, kitchen islands or even creating home organization storage. First thing that you need to do is to set your new cupboards against the wall at the desired height that you like. Then, you need to mark the location of their attachment screw holes against the wall. Next thing to do is to set the suspension rail along each of the marked that you have made earlier and ensure that the rail is the same level from one end to the other. To really make sure that it is level, you can set a carpenter’s level on top of each suspension rail. Make sure that you do not ever climb or hang onto the cabinets in order to avoid pulling out the cabinets off the wall attachments. After that, you can adjust the suspension rails position until you are confident that the level shows that each rail is already in a straight position. Next, you need to mark the locations of holes in each suspension rail every eight inches and make sure that you managed to keep the rail straight as you proceed. The next step for you to do is to remove the rails and insert a masonry drill bit into a hammer drill where you need to set the drill on the hammer setting with the highest power available. Then, you have to drill into the brick at each of the marked location in order to create 2-inch-deep holes. You can simply use a masonry drill bit instead of using masonry screws used in the installation. This is because the masonry drill bit is much smaller in diameter and suitable for the job. After that, you can set the suspension rail over the drilled holes. You must also place a 2-inch masonry screw into each of the hole before you can start drilling them carefully into the holes. Remember not to over-tighten the screws when using the drill. Proceed with the task of hanging the other suspension rail using the same technique. The next step that you need to do is to slide the attachment bolts through the washers and then through the outside if each of your cabinet. Then, you have to attach the included nut onto the inside of the cabinet and make sure to secure it firmly in place. Next, you should slide the bolt head into the suspension rail. After that, the cabinet need to be slide down into position right at the desired location before you could tighten up the bolts within the cabinet by using a wrench until it is secured tightly so that they would not be able to move around. Repeat the same process for hanging the rest of the cabinets. You must always ensure that you have installed your cabinets securely. Attach the cabinets together by using screws or finishing nails if it is necessary. This entry was posted in Home Improvement on January 29, 2012 by Mike.